Friday was Zaytuna's Summer Arabic Intensive graduation in the Bancroft Hotel in Berkeley. Stage floral arrangement and diplomas. The flowers consisted of White Dahlia's, Fever Few, Snow on the Mountain and Bells of Ireland. Dining table flowers; white Orchids submerged in water with floating candles. Yesterday was the big day for Abdellah's pool and craft Birthday party. The plan was to keep it simple, knowing what kids like the most is just playing with each other, swimming was the main event. The kids also did some dinosaur cookie decorating as well as some face and tempera painting. 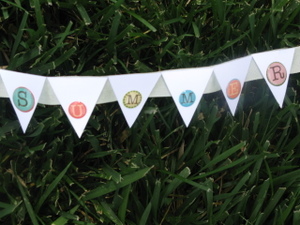 We made the kids favors out of crepe paper. 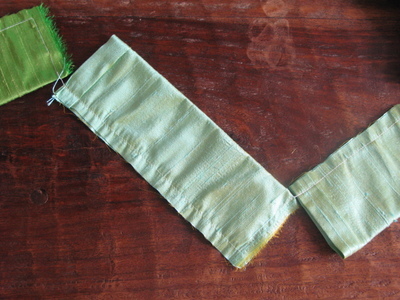 The treats were rolled up in the crepe paper into tubes and then both ends were tied with twine & a little frog. We made the silver trays a little more kid festive by decorating them with crepe paper that we cut, fringed and then attached to the top and sides of the tray. 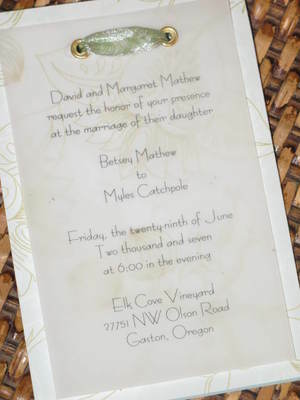 I just took a look at Redenvelope, they have an amazing selection of personalized gift items. Redenvelope is one of my favorite online companies, and they are offering a special just for you. Use PRESENTS10 Promotion code at checkout. We had a lovely party for the baby last night. It was a warm evening and the party was held on the back patio under the stars and a Mauritanian tent. 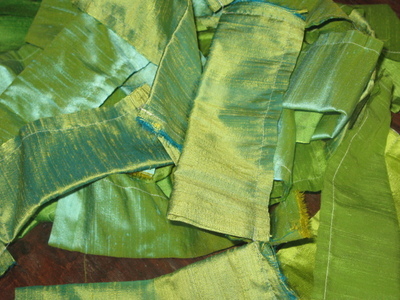 Carpets and cushions were laid for seating and rounds of Mauritanian sweet mint tea was served. With the heat here parties start late, ours started about 9:00 PM and went till the wee hours of the morning. 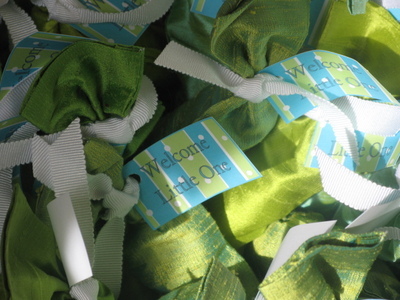 These bon bon favors were created by cutting crepe paper into squares, adding green mango jelly beans and then rolling into a tube shape and tying them at the ends. 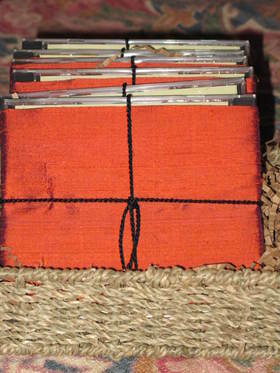 They were finished by attaching wraps with the decorative paper. 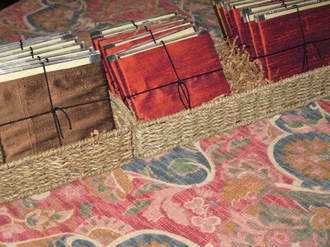 The favors were then stacked around paper flowers on large silver Moroccan trays. 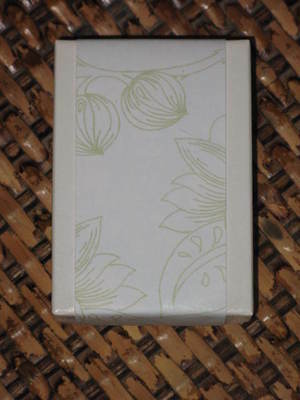 The pretty paper used for the favor wraps is from Paper Source . Lollies for my niece Betsey's Baby Shower. 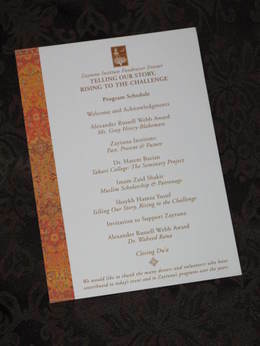 I recently worked on a fund raising event and was blessed to collaborate again with Su Pittam. 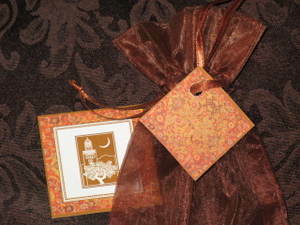 We created the event programs, favor tags, and gift bag stickers. 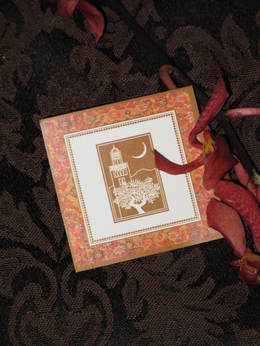 Our inspiration was a beautiful photo of an oriental rug which we used as a border for all the items. 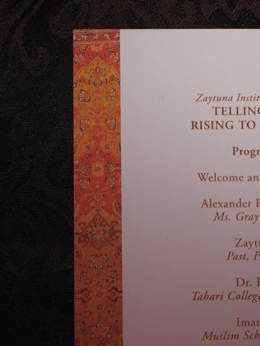 Zaytuna's logo was created by Abdul-Latif Whiteman. The homeschooling co-op that my son will be attending this year had a brilliant idea for a fund raiser. They recently found a new site which is located in a very peaceful area and the building itself is a warm and soothing space. So before all the children's items get moved in, the idea was to have a Women's Spa Day which they are calling "Tea and Time Away". The event will have 4 different areas, High Tea, Spa treatments (by professionals) Swimming and a lounge area with henna and some light massage. My part in the event is the decorating and creating the ambiance of a spa in the four different spaces of the event. 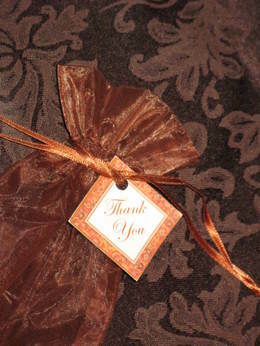 Since this is an event that people are paying to attend we wanted to make favors for them as a little thank you. 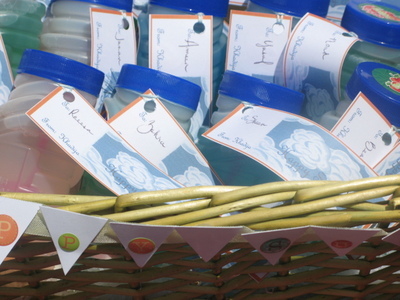 Keeping the vision of the spa in mind I decided to make scented bath salts to give to the attendees. The favors above are made with Rose Geranium essential oil. 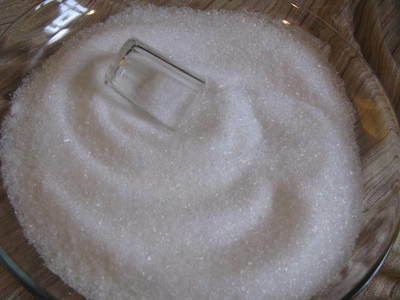 The mixture can now be packaged for giving or kept in a tight fitting jar. 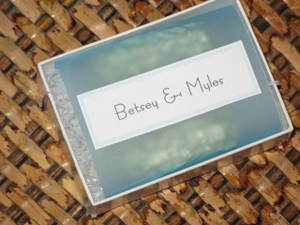 My niece Betsey just got married and I had the pleasure of making her favors. 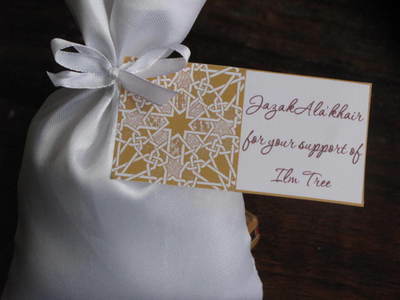 Once I saw her pretty invitation I decided to use it as inspiration for the favors. 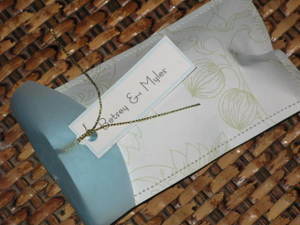 My hope was to stylistically create a minimal but elegant favor and to that end I created two different styles, one made with a box lined with velum and wrapped with the copied image from the stationary. 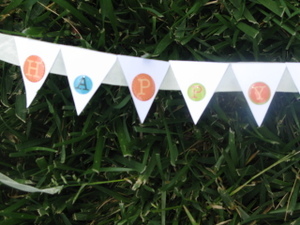 The other style I made by sewing the velum and card stock together. I actually liked them both but decided to go with the box. I made 150 of them and then sent them on their way to Betsey. 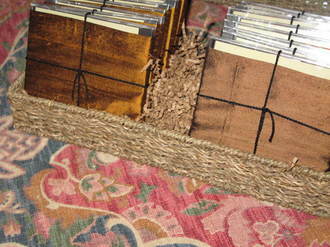 I was so pleased that she liked the little packages. Since I was not able to attend the wedding the making of the favors was a way for me to be with her in love as well as spirit. 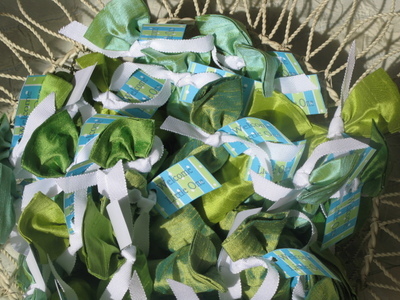 These favors were made in silk with 5 different shades of green and are tied with a rayon grosgrain ribbon. 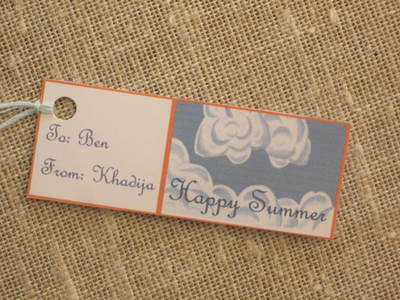 Sewing the favors in tandem is a quick and easy way to make them.